Wednesday January 20th 1904 It was raining and freezing all day. I ironed and dressed chickens. It was nearly night when I got through. The boys went to the pasture for the horses in the afternoon. Fred brought Mollie back. Thursday January 21st 1904 I was very busy all forenoon with the regular work had churning again. Every thing is a sheet of ice. I got things ready to make chicken salad. Mollie helped me in the evening. 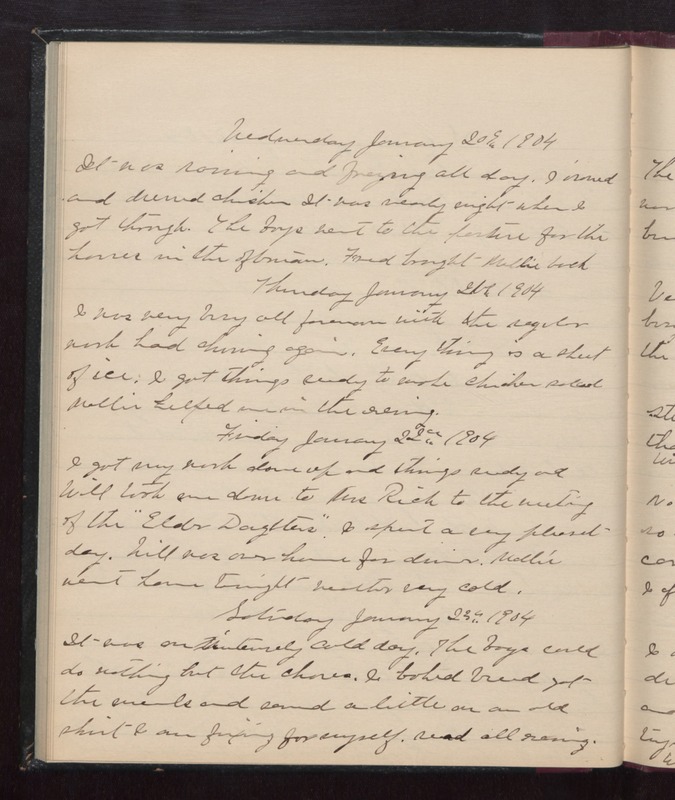 Friday January 22nd 1904 I got my work done up and things ready and Will took me down to Mrs Rich to the meeting of the "Elder Daughters. : I spent a very pleasant day. Will was over home for dinner. Mollie went home tonight. weather very cold. Saturday January 23rd 1904 It was an intensely cold day. The boys could do nothing but the chores. I baked bread got the meals and sewed a little on an old skirt I am fixing for myself. read all evening.